It's so hard to get up and out when it seems like the rest of the world has the day off, isn't it. Your office doesn't do Columbus day, though, and you're such an over achiever that you'd work from home anyway. To top it all off, you're in a bit of a strange mood (channeling Ms. Hannighan, perhaps?). Maybe it's the changing weather. A patchy pair of lace up booties, like this one from Giorgio Armani (or something similar), are just what you need today. Yes, there's a dark, autumnal feel to them, but the light seafoam green patches add a bit of optimism. A heel that's almost 5 inches high never hurt your disposition either. Now, if you could only shake that pesky feeling of fatigue. Your morning coffee never did actually kick in, and the one after lunch only kept you from falling asleep during your weekly conference call. However, you can't bring yourself to miss Monday Night Football with the girls. Tonight your drink of choice should be the Awakening. 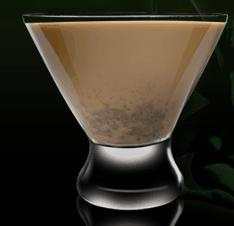 A definite "big girl" drink, it combines Lucid Absinthe, Starbucks Coffee Liqueur and Starbucks Creme Liqueur. While the new incarnation of Absinthe doesn't contain enough wormwood to be hallucinogenic, it still makes a strong drink. The characteristic licorice flavor will be muted some by the coffee, but the general taste of the drink will be an eye opener if nothing else. As always, mind your intake. You might not hallucinate, but too many tonight could lead to your seeing stars in the morning. Those shoes are HOT!!! I want'em I want'em!! !